I began my career with my apprenticeship which was through Peugeot and I completed my 3 year apprenticeship. I moved to an independent garage called Central Tyres for a few years. I moved back into a Fiat/Alfa Romeo dealer for few years. I moved back into the independent sector for a number of years before setting-up my own business. 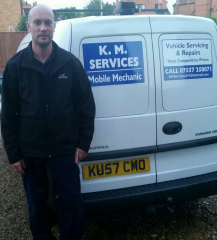 KM Services began its life in 2014 and the business has developed well to date. I cater for all makes/models of vehicle and tackle all repairs. Kevin was very friendly and knowledgeable. I was happy with the work he carried out. Job done quickly, arrived on time, job done in your driveway what else would you want? Excellent! Kevin contacted me the evening before the car was due to be MOTd and serviced and offered to pick the car up that evening or the next day. He arrived promptly and was very amiable and helpful. The car passed its MOT and seems to be running very well. Very pleased! I really appreciate that Kevin did 4 hrs job in such weather as we had today - really cold, windy, snowing and raining, all together. First class service. Really pleased with the work Kevin carried out for me and very easy to deal with. Kevin was fantastic, he was flexible about the time he arrived and sorted the problem straight away. He was friendly and patient despite me being a complete idiot ! I can highly recommend him and the Click Mechanic service, thank you. Kevin was brilliant, friendly & knowledgeable. Was unable to diagnose issue, despite much trying, but recommended a Vauxhall specialist. Very friendly, helpful and knowledgeable. Inspection and diagnostic was carried out quickly and the problem was identified really quickly. Kevin helped me to understand the problem fully and then carried out the work necessary. Car is now working wonderfully! Kevin was fast and efficient without compromise to quality. I am very pleased with the outcome. Kenin was very friendly and carried out the service and also left area clean and tidy. This now the second time he has carried out work for me on my car and would certainly use again when required.